With the cold weather here, it is time to add some protection to those lips against exposure to the elements. The cold and the wind is the perfect formula to bring about chapped lips. Even if you are not exposed to weather that is all that cold, exposure to the sun, wind and rain in general can still cause lips to dry and hurt. 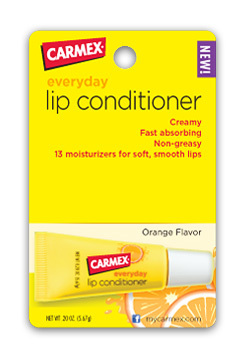 Carmex is a great solution to keeping your lips soft and smooth. Carmex was first created by hand in 1937 by Alfred Woelbing who suffered from cold sores. He began marketing his creation by visiting pharmacies one by one. If they weren’t interested, he gave them a dozen jars for free along with a postcard to reorder. In no time, the pharmacies sold the free samples and the reorder forms starting coming in. He continued making Carmex by hand until 1950. In 1975 it moved to its current manufacturing site where it has now expanded to include ultra hydrating Carmex Moisture Plus as well as soothing skin care products. It is designed, with the use of lanolin, to replicate what our lipid bilayer does is helping to retain the moisture in your lips. Their formula includes the ingredient dimethicone that aids the moisturization process and protects the skin on your lips. Their formula also includes allantoin that effectively aids with moisturization plus helps the healing process. You can find Carmex in 25 countries around the globe. In fact they sell 130 products every minute! You can find Carmex products, including this new Everday Lip Conditioner at most major retailers, including Walmart and Walgreens for about $1.99.